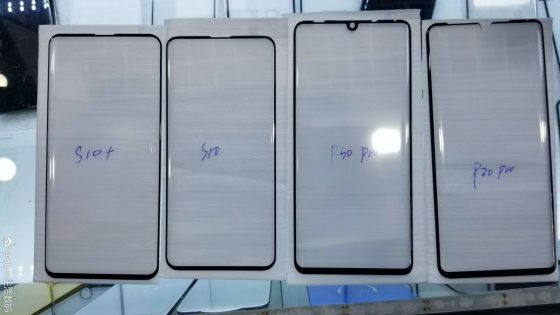 Samsung Galaxy S10, Huawei P30 Pro are subject to more and more frequent leaks . More and more photos appear on the web. Recently, these were pics of the case , which revealed to us what you can expect on the backs of Chinese phones. Now, these are pictures presenting screen protectors, which have been published on the pages of the Weibo social networking site, which even roars with gossip. Huawei P30 Pro will get a screen with a round notch at the top for a selfie camera. In the model without a note, Pro in the name is supposed to look different. The display will cover almost the entire front panel of the case, but at the bottom you can see a thicker frame. Then we have screen protectors for Samsung Galaxy S10 smartphones. Samsung Galaxy S10 will get a screen that will also cover almost the entire front panel. Here, however, you can not see indentations for the selfie cameras that will be out. We know this already thanks to renderings published by Onleaks . In the model without a plus, Plus will be a single camera. It is very possible that the Samsung Galaxy S10 will debut in front of the Huawei P30 Pro. We expect the first phone calls in the second half of February . The Chinese can wait until March. As was the case with this year’s P20 models. Everything will turn out over time.